Custom Fire and Security have a team of highly skilled technicians that specialise in supplying, installing and repairing an extensive range of safety and security systems including fire alarms, CCTV systems, security cameras, house alarms, commercial security systems and alarm systems in Poole, Bournemouth, Dorchester, Weymouth, Dorset and Hampshire, Custom Fire and Security have over 30 years’ experience in providing alarm systems and are an NSI Gold accredited company. If you are looking to improve your business or home security, install a CCTV system, repair your burglar alarm or upgrade to a wireless alarm system, Custom Fire and Security have the solution for all your security needs. Custom Fire and Security have recently upgraded the CastlePoint Shopping Centre CCTV system in Bournemouth, installed CCTV for Dorset schools & security systems for Dorset NHS hospitals. They also installed a complex addressable fire alarm system in a large Hampshire warehouse. 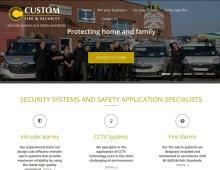 For more information on the range of fire alarms, CCTV systems, business security systems and house alarms available contact Custom Fire and Security. Custom Fire and Security are a professional security system installer servicing Poole, Bournemouth, Dorchester, Weymouth, Dorset and Hampshire and are a member of Checkatrade.